One does not necessarily expect Harald Zwart to direct a near-epic World War II drama based on the heroic exploits of a real-life Norwegian who, deployed from Scotland to his own country on an abortive mission, finds himself struggling against the harshest elements as he tries to escape encroaching Nazis. “Harald WHO?” you may be asking. You know—Harald Zwart, the director of 2001’s “One Night At McCools,” one of the almost innumerable Tarantino burlesques produced in the early days of the 21st century. You have to have seen that on cable, or parts thereof, at least a half dozen times. Okay, maybe you didn’t. But I did. And in all that time I did not, I have to admit, take notice of whoever directed it. But it was Harald Zwart, who went on to make, in Hollywood, pictures such as “Agent Cody Banks,” “The Pink Panther 2” (the Steve Martin Pink Panther, I hasten to point out) and "The Karate Kid." But Harald Zwart, Hollywood CV notwithstanding, is a child of the Netherlands, and has long cherished a desire to tell the story of Jan Baalsrud, a Norwegian resistance soldier. Trained in the U.K., Baalsrud was part of a dozen fighters sent to Norway on a mission to wreck a German airbase there. The mission was practically over before it even had a chance to begin, and Baalsrud’s escape from pursuing Nazis is one of the most harrowing and arguably inspiring. In the movie’s first hour, the stoic Baalsrud, resigned to head for Sweden, which is at least a neutral country, tries to stay ahead of an avalanche on skis. It doesn’t work out, which makes for a suspenseful scene full of spectacular visuals. When Baalsrud, played with resilience by Thomas Gullestad, isn’t dodging Germans, his fights against the elements bring to mind films such as “The Revenant” and even “Man in the Wilderness” or “Jeremiah Johnson.” Zwart handles these scenes with conscientious competence that makes the character’s suffering credible if not palpable. And suffer Baalsrud does, the cold affecting his body to the extent that he’s forced to go to grisly extremes to stay alive. The director doesn’t do as well with the characterizations. (Some measure of blame here goes to screenwriter Petter Skavlan, here credited as Alex Boe.) With his mission scotched pretty much from the start, there’s no insight into Baalsrud’s sense of purpose beyond the will to survive. What conversations he has with the people who protect him at various points in his journey are pretty commonplace. The nightmare sequences, in which Baalsrud dreams of capture and more, do not help much. 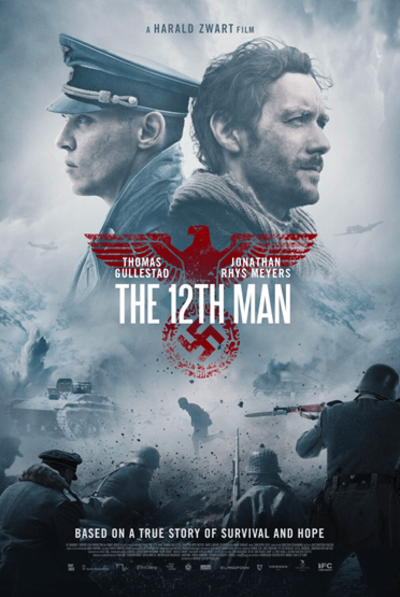 And the movie is one-dimensional in its portrayal of the Nazis intent on capturing their “12th man” (one of the most dogged of whom is played by Jonathan Rhys Meyers). This seems an odd complaint but when you’ve hired human actors to do nothing but sneer, shout, and shoot guns, their onscreen function can get ever so slightly monotonous. This is not the movie’s only reliance on commonplaces but it’s the most prominent. On the more-plus side, the movie is beautifully shot; Geir Hartly Andreassen (who also shot the 2012 remake of “Kon-Tiki,” which was also written by Skavlan) conveys both the stately beauty and the dreadful cold of the landscapes over which Baalsrud must traverse.